This recipe shouldn't be considered exact. I used what I had on hand from a recent trip to the farmers market. When shopping such markets, it's so easy to pick up things that "look good" without having a sense of how they should be used. Pasta dishes like this are a good way to make sure they don't go to waste. Feel free to switch in our out vegetables, use other greens or herbs, add sausage, etc. Since they are thicker, remove stems from greens like chard and sauté them first with other vegetables. 1. Bring a large pot of salted water to boil. Cook pasta according to package directions for al dente. Drain and set aside. 2. 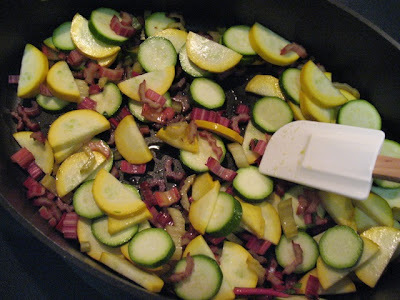 In a large sauté pan, heat olive oil over medium heat. Saute zucchini and chard stems until softened, 8-10 minutes. Add garlic, scallions, corn, tomatoes, dried herbs, salt and pepper, and cook another 2-3 minutes. Add the chard leaves and cook until the leaves begin to wilt, about 2 minutes. Add vermouth and reduce heat to simmer, stirring to incorporate flavors. Gently stir in the ricotta, then add the pasta and stir to combine and coat with sauce. Serve topped with fresh basil and parmigiano-reggiano. Okay! 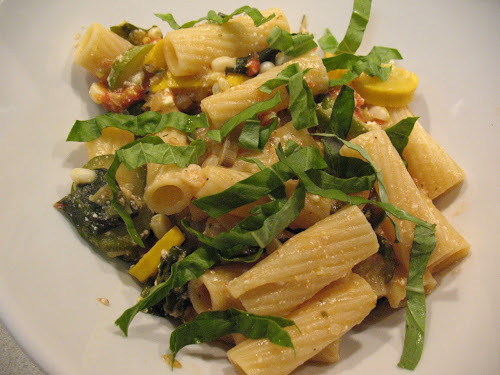 Or maybe wait until the fall, so it will be fall vegetable pasta.